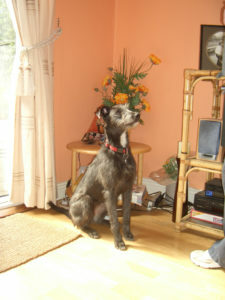 You are here: Home / Testimonials / Mollie deerhound cross puppy. Robert and his staff worked tirelessly to find Mollie. My 8-month-old deerhound cross puppy Mollie went missing one Thursday afternoon while I was walking my two dogs in Dodder Valley Park. One moment she was there, the next she was gone. I whistled for her, but there was this eerie silence. For the next two hours I searched the park, with the help of my friends and fellow dog walkers, but nothing. Over the course of the next three days, I continued to search, handing out my phone number to anybody I met in the park, as well as visiting four local halting sites, in case she had wandered in there. By Sunday afternoon I was desperate. Then I got a text from a friend with details of how to contact the Pet Detective. I didn’t think there was such a person! Two hours later Robert Kenny was in my house, taking down all the details of Mollie’s disappearance; he was convinced she’d been stolen. Robert and his staff worked tirelessly to find Mollie. They put up posters with her picture on them all over Co Dublin and traveled to Wicklow in their search for her. Robert phoned me regularly with updates on the search, and I never gave up believing he wouldn’t find her. Then on a Wednesday evening, six days after she went missing, we had a breakthrough. Robert got a call from a mystery man, number withheld, to say he’d found a dog answering to Mollie’s description, straying in the Tallaght area. After a series of calls, it was finally agreed that he would meet us with the dog in the car park of a local hotel, opposite the Garda station. Robert assured us we would be quite safe, as he’d alerted the Gardai to what was about to take place. They arrived in at least two vehicles and appeared leading a very subdued Mollie. It was only later we realised she had been sedated. Her collar was gone, of course, and they had tied a bit of washing line round her neck. Her lead was a length of electric cable. They didn’t ask for a reward, and we didn’t offer one. We just pretended to believe their story, said thanks very much and drove off. If it hadn’t been for Robert Kenny we would never have got her back. We wouldn’t have known where to look or what to do. She would probably be in England by now, and her life would not have been a happy one. Thank you, Robert and your wonderful staff, from us all.